One of the gun industry's big January announcements was Glock's additions to their line-up of single stack pistols. This year's introductions include the Model 48, a single stack version of their venerable Model 19, and the 43X, which is basically the slide of the Model 43 mated to the 10 round grip frame of the (G19 sized) model 48. One of the most obvious features of both new offerings is the matte stainless PVD coated slide. PVD is a very tough coating used on everything from watch parts to heavy machinery. I'm not sure why they used the PVD coating rather than using a stainless steel slide, but I'm sure Glock has its reasons. The SIG P365 is clearly smaller in all but one dimension and boasted a 10 round capacity that made it the concealed carry darling of 2018. 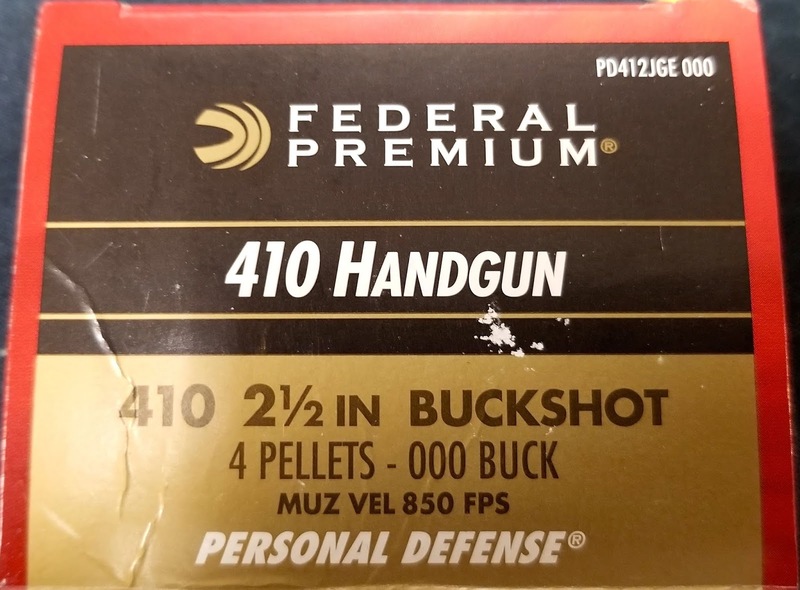 However, for some shooters, it (as well as the standard 43) was just too small. 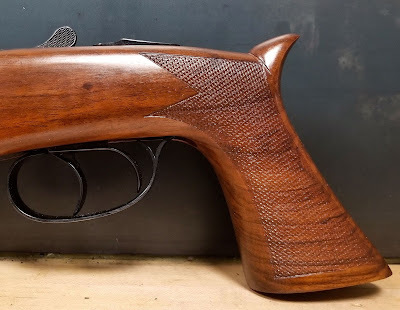 The grip height could be improved by the use of SIG's 12 round, extended magazine but the width and overall length was still too small for some customers. The 43X solves this issue. The height of the 43X is taller than the standard 43 largely due to the longer grip that angles diagonally backward. The grip is also just a tad bit wider than the standard 43 and I tend to prefer the feel of the 43X's grip over that of the 43 or the SIG P365. The extra length is probably the reason that I shoot the 43X better than the other two pistols and the increased grip height is not going to make it decidedly more difficult to conceal. The taller, angled grip frame is also the reason that 43X magazines will not fit into the original Glock 43. The 43X also includes the wider cocking serrations (both front and rear) of Glock's Generation 5 models and I like this feature over the slimmer serrations of the standard 43. Glock is currently producing the 43X (and the 48) with three different options in terms of sights. 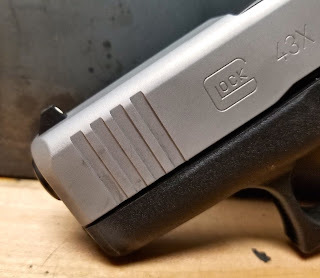 The first option is the original Glock painted-on white dot front sight with the rear outlined sight that you will want to replace as soon as you can. 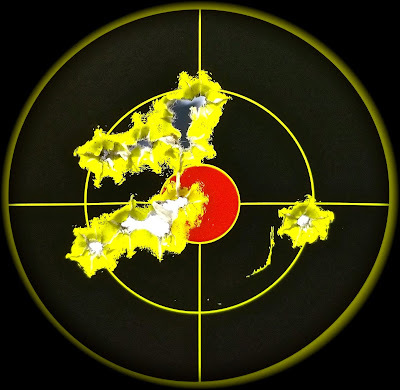 The second option is Glock's own night sight combination and the third option is the Ameriglo night sight with the blaze orange dot on the front. Obviously there is an incremental price increase if you select one of the night sight options instead of the original Glock sights. The biggest surprise is the trigger pull. The trigger on our rental pistol is much better than any other non-modified Glock trigger I have ever experienced. I will be extremely displeased if the next ones we receive have stronger, grittier pulls. The 43X shoots better for me than most other Glock at the abbreviated range for which the 43X is most likely to be used. 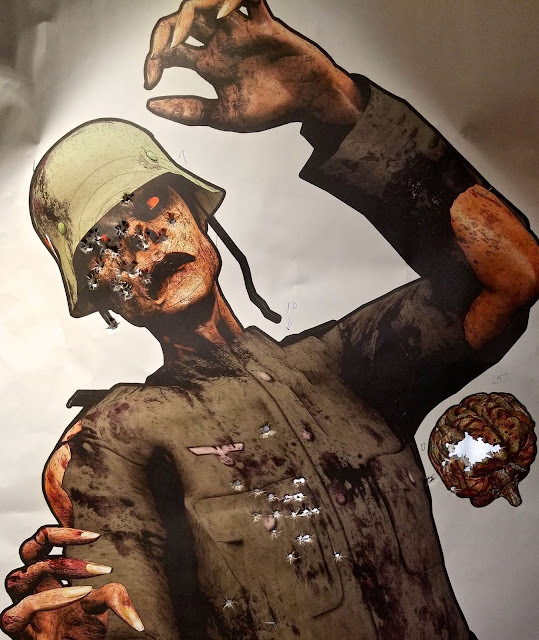 The brain was shot at 5 yards, the head was shot at 7 yards and the torso was set out to 10 yards. 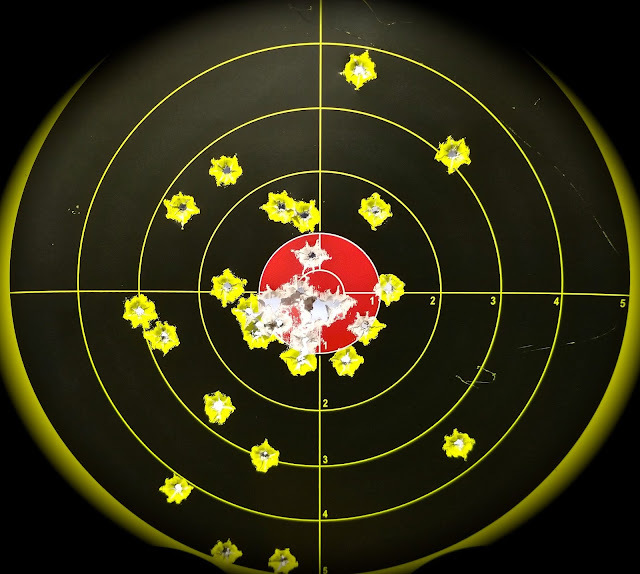 20 rounds was fired at each of these distances. 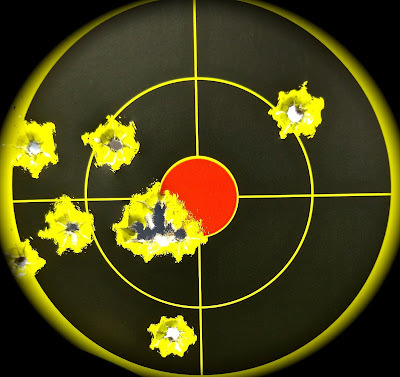 At 20 yards I fired 40 rounds with 3 missing the target, 19 rounds penetrating center mass and the remainder hitting the other areas of the target. I have a hot and cold relationship concerning Glock pistols and currently, just like our January weather, it has been pretty chilly. However, I really like this pistol. This gets a huge thumbs up from me. If you want to shoot one, come see me at Stock and Barrel in Chanhassen. We have one in the rental case! I have great respect for Glocks but it is difficult for me to get excited about them. 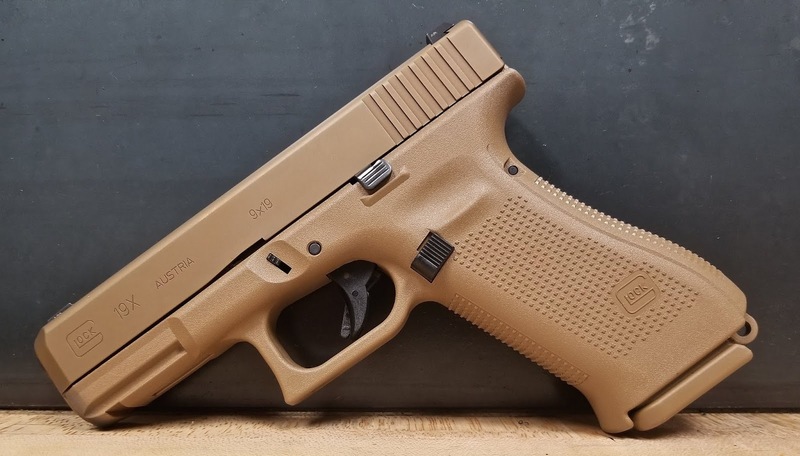 I have been of the opinion that everyone should own a Glock 19 due to their ruggedness, reliability and ease of parts replacement. However, now I will Include the 19X to my list of components for a standard battery. 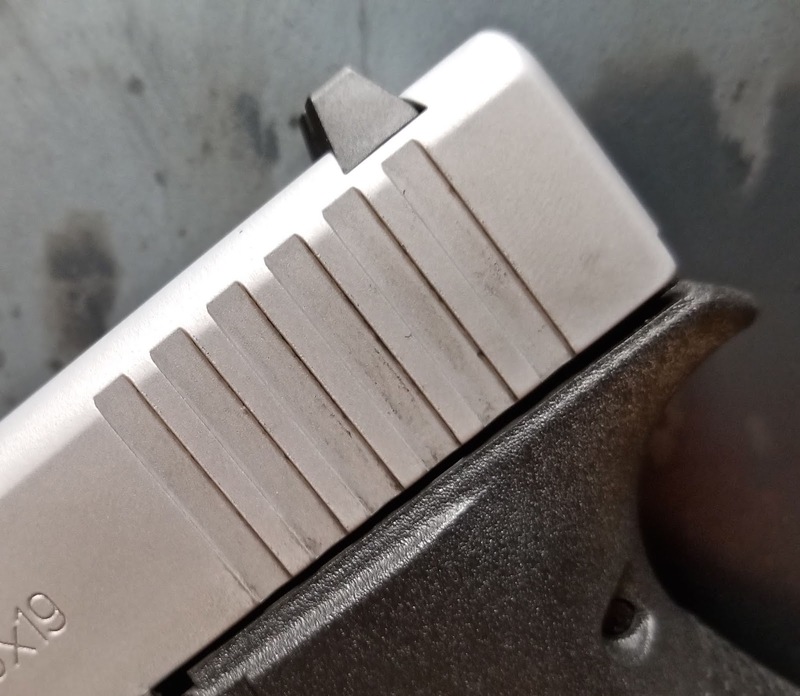 If you are unaware, the 19X (or 19X Crossover as Glock sometimes refers to it) the the slide and barrel of a Glock 19 mated to a Glock 17 frame. Let's take a quick look at the specifications. I must confess that, when these came out, I thought that Glock's manufacturing group must have read the work order incorrectly and reversed the concept of the pistol. 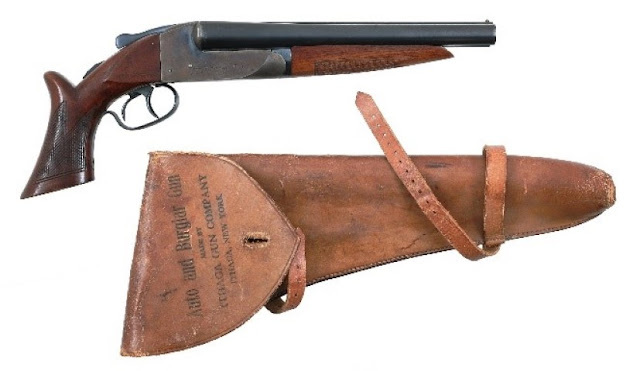 I thought it made much more sense to put the longer barrel and slide of the model 17 on the more compact grip frame of the model 19 thereby producing a compact grip for easier concealment along with the longer line of sight and inherent increase in accuracy with the longer barrel. Apparently though, input from tactical operators (Geez, I hate that phrase) professed a desire for increased capacity and shorter barrel when maneuvering in tighter spaces. Thus, the 19X Crossover was born. Although the 19X is a Gen 5 model there are two differences between the 19X and the Gen 5s that Glock is making for the FBI. There is no orange colored magazine follower and no flared magazine well. Although I kind of like the slightly flared magazine well, neither of these omissions are deal breakers for me. In addition to the specifications in the table above, the 19X includes the standard Gen 5 "Marksman" barrel with enhanced polygonal rifling and a reverse crown to increase accuracy. Also, a slide stop is present on both the left and right side of the frame making this an ambidextrous handgun. 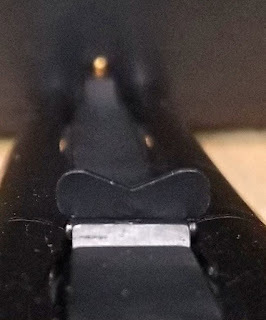 The finish on the 19X's slide is nPVD. Standby while I attempt to explain what this is (I'm sure Doc Wesson will correct me if I get this wrong). PVD stands for Physical Vapor Deposition. Basically this process vaporizes specific materials, such as titanium, chromium or zirconium. The vaporized materials are then deposited into nitrogen gas to form a thin, but extremely durable, nitride coating. The PVD coating increases wear resistance, reduces friction and improves the appearance. 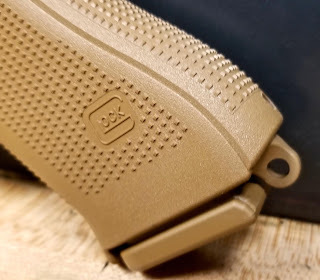 I will say this, the slide has a metallic glint to it that definitely gives it a more lively look then the dull finish of most Cerakoted firearms. One great addition to the 19X is that Glock does not equip it with their usual plastic, disposable sights. These come with Glock's own night sights with are made from steel. They are definitely easier to work with than Glock's normal and nominal sighting set-up. This Glock also comes with a lanyard loop as requested by most militaries of the world, several foreign police departments and should be a standard feature for dancing FBI agents (it you don't know what that refers to, Google is your friend). For some reason all Glocks tend to shoot low and to the left for me. 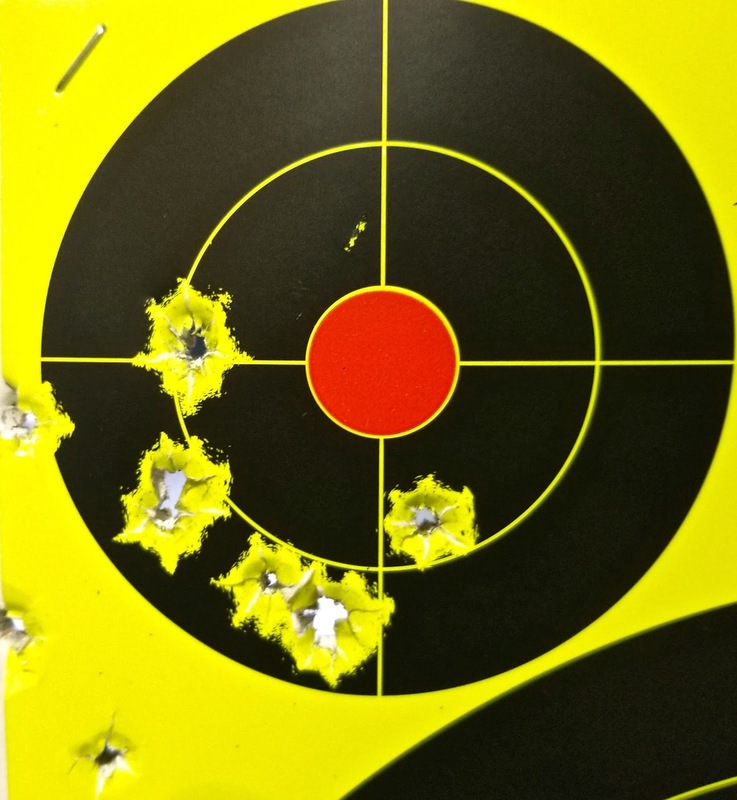 I was fairly exasperated when the 19X rewarded me with this 10 shot group at 15 feet. 7 rounds low and to the left on the 3 inch bullseye and 3 rounds flying into the outer stratosphere. 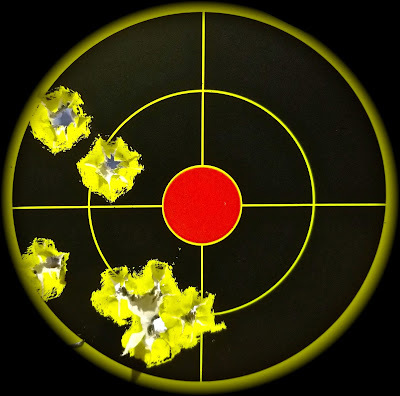 I was a little surprised when I rolled the target down to 21 feet and shot a much better 10 round group. 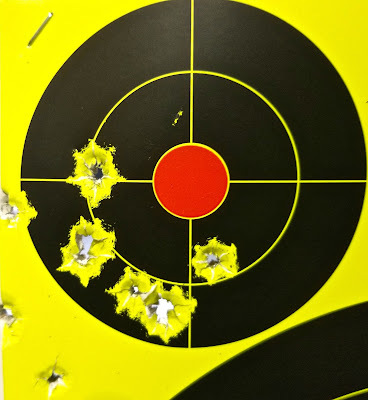 How could I possible shoot a better group at a further distance? 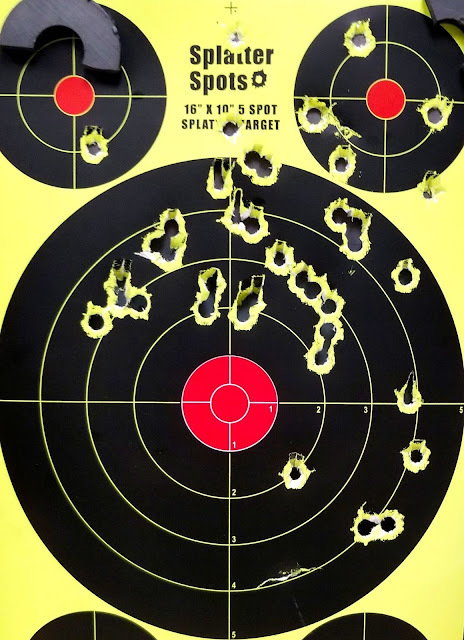 Maybe the pistol was sighted-in further out than 15 feet...that would make sense. 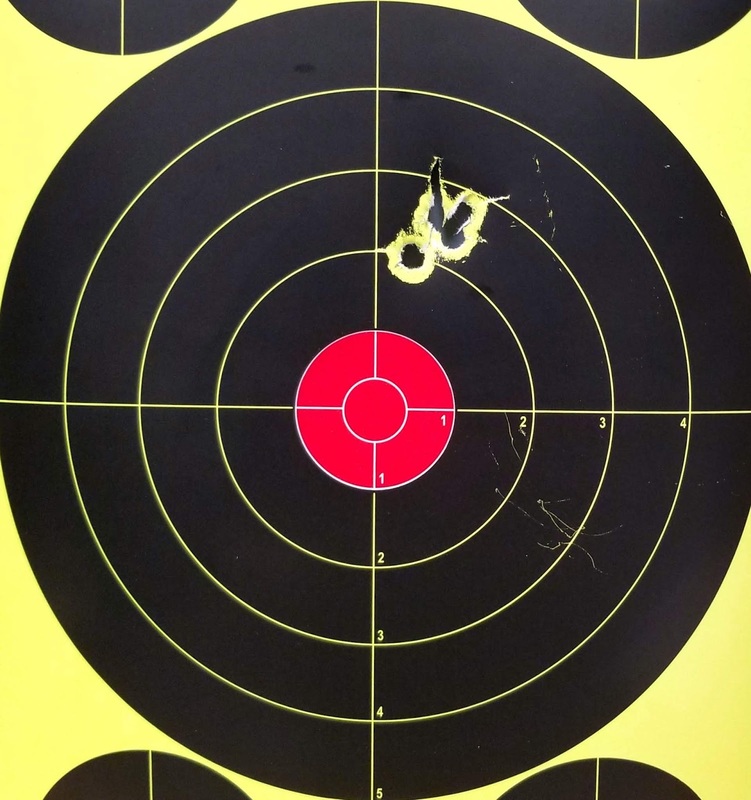 So then I pushed the target out to 30 feet and still shot a better group than what I shot at half the distance! 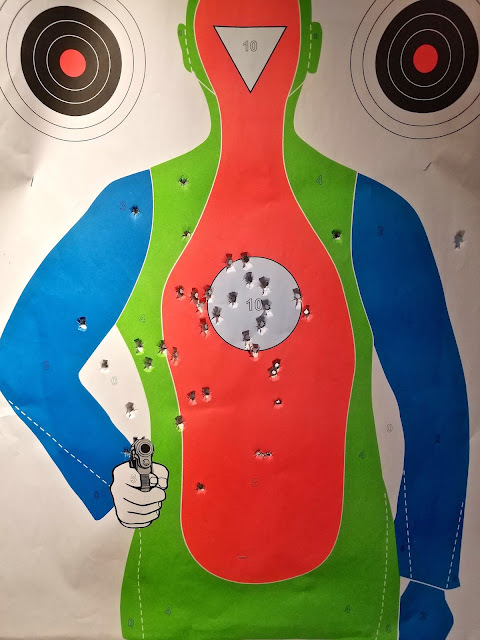 Perhaps I am getting more familiar with the pistol. 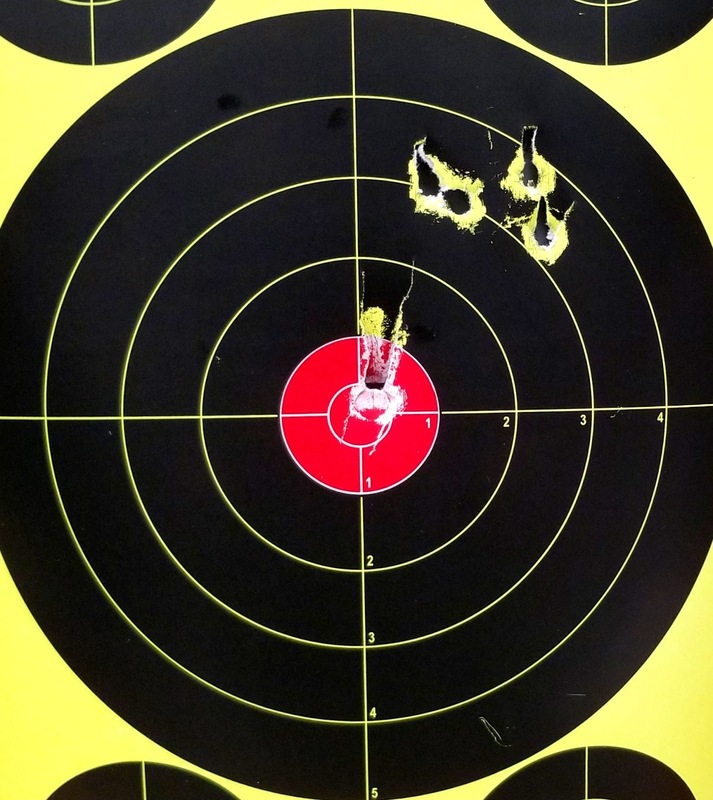 Here's the 60 foot target with 30 rounds. These would all be very good torso hits. So...just to satisfy my curiosity I rolled it back to 15 feet. 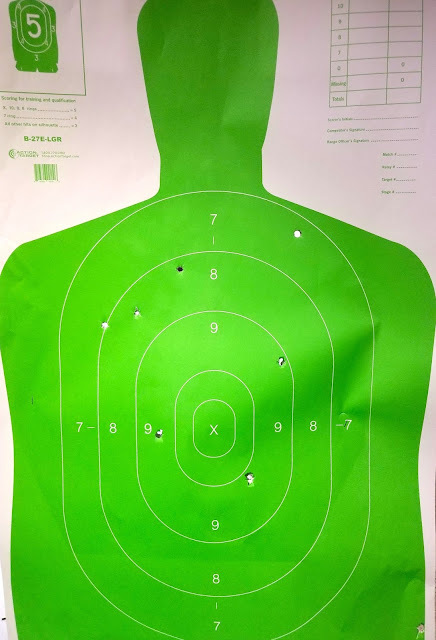 Yeah, I think after the first 10 rounds fired on target #1, the Glock 19X and I became better friends. 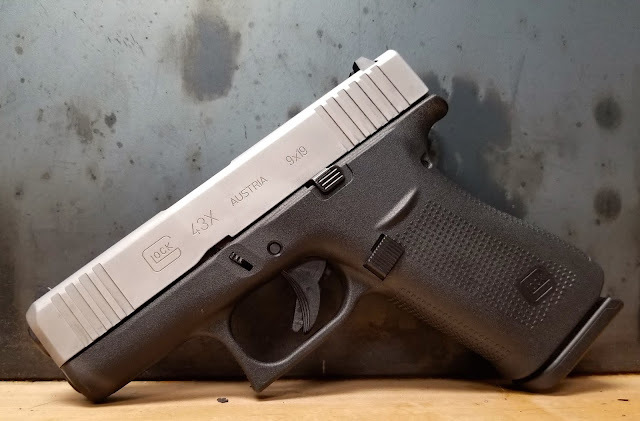 All in all, I think this is the best pistol Glock has produced in quite a while. Better sights, great color and better than average metal coating, and a good trigger. All this and one 17 round magazine and two 19 rounders! This could cause me to upgrade from my Gen 3 pistol.